Posted on Sun, Jan 15, 2012 : 11:19 a.m. Updated: U-M recruit Nik Stauskas' game on ESPNU. 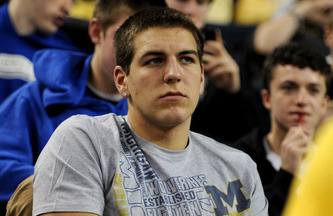 Michigan basketball fans hoping to get a live look at incoming recruit Mitch McGary are in luck. The 6-foot-10 power forward and his No. 1-ranked Brewster Academy (N.H.) squad will be featured on ESPN at 4 p.m. today. Brewster Academy is taking on rival Tilton School (N.J.) in the Naismith Memorial Basketball Hall of Fame’s 2012 Spalding Hoophall Classic. The five-day tournament features some of the best teams and players in the nation. Michigan basketball recruit Mitch McGary. Another Michigan recruit is playing in the same tournament. ESPNU (Comcast channel 735 in Ann Arbor) will broadcast Nik Stauskas and his St. Mark’s School (Mass.) team's game against Friends Central (Pa.) at 2 p.m. today. McGary, the No. 3-ranked recruit in the class of 2012 according to Rivals, will go head-to-head with Tilton’s 6-foot-10 Nerlens Noel, Rivals’ No. 3 recruit in the 2013 class, and 6-foot-7 power forward Georges Niang, who will play at Iowa State. The teams played in early December, with Brewster winning 84-78 on their home court. The high school basketball blog on ESPN.com previewed the rematch. Brewster has a handful of other Division I recruits, including T.J. Warren (North Carolina State), Semaj Christon (Xavier), Jalen Reynolds (Xavier) and Deonte Burton (Marquette). Mon, Jan 16, 2012 : 1:14 p.m.
<a href="http://www.masslive.com/hoophallclassic/index.ssf/2012/01/brewster_academy_beats_tilton.html" rel='nofollow'>http://www.masslive.com/hoophallclassic/index.ssf/2012/01/brewster_academy_beats_tilton.html</a> Mitch had a bad game, scoring only 3pts, and junior Nerlen Noels, his counterpart, dominated Mitch with 22 pts, 8 Rebs, 7 BS. Maybe Beilin should recruit Noels.